Scientific spacecraft, landers, rovers and sensor networks are typically highly optimised expensive one off designs that can only be infrequently funded by space agencies. This makes high risk or duplicate missions unpalatable and provides few opportunities for economies of scale to significantly drive down costs. 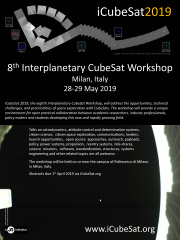 We propose a very low cost generic scientific spacecraft/lander/rover/sensor ‘ChipCube’ architecture based on an adaptable and modular ChipSat / CubeSat system. The system uses CubeSats to minimise launch costs and deliver swarms of ChipSat based secondary exploration systems to collect and return data for relay to earth. The ChipSat element of the system is based around a spacecraft on-a-single-substrate (such as our gallium arsenide based GaAstroChip) that can be configured to act as part of a swarm of independent spacecraft, a lander, a limited range rover system, penetrator or a component of another exploration system. Important design assumptions include a need to support high volume low cost mass production, application dependent parametric design, a selection of integrated sensors, extensible software and hardware interfaces, infrequent low speed communications and significant rates of attrition of individual ChipSats throughout a mission. The CubeSat element of the system is a standards based ChipSat deployment mechanism designed to drop into unmodified commercial off the shelf CubeSat structures from multiple manufacturers. The deployer can range in size from 0.2 to 3U and can be entirely independent of the host CubeSat or CubeSat compatible piggyback or smart ballast rideshare. Typically, however, a mission specific 1-6U CubeSat will be launched to transport ChipSats to a deployment point using an on-board propulsion system capable of imparting 1km/s+ delta-V such as a water fuelled EPiC system, or a Xenon fuelled ion drive. Post deployment, the CubeSat supports the ChipSats by providing services such as data relay. The ChipCube project is an open source open access project using elements designed for KickSat and from the Open Source Space System. A single quantum of exploration (such as an individual ChipSat) will be inexpensive enough that all its costs (including manufacture, deployment and operation) could be afforded by a private individual for education, entertainment or profit. Prototypes to demonstrate all elements of the system have been built or are under construction, and a launch opportunity is being sought for an end to end demonstration mission.